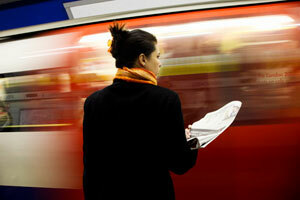 Find information on all forms of public transport in London, routes, maps, traffic and travel. Roads and public transport around London. Transport to and from London is very easy these days with five international airports and a range of ferries leaving from ports along the coastline plus the trains through the channel tunnel. Transport options within the UK range from internal air travel (probably not worth it if less than 200 miles), rail or coach. London Heathrow, just to the west of London, is one of the world’s busiest international airports serving destinations worldwide and carrying over three million passengers annually. Eurostar train services have made travelling to and from the centre of Paris and onward destinations in Europe via the channel tunnel, a quick and pleasant experience. In 2009 30 million overseas tourists visited the UK, spending £16Bn and making tourism the UK’s third foreign exchange earner. Transport within London is efficient if somewhat expensive by most big city standards. Make sure you get a Transport for London (oyster.tfl.gov.uk) pre-pay card for bus, tube and train journeys around the city since a single one-stop tube journey is a prohibitive £4 otherwise. Bus or tube is the fastest and easiest way to get around town - driving in the centre attracts a congestion charge is painfully slow and ridiculously expensive to park when you eventually reach your destination. The London Underground or tube was the world’s first underground railway or metro opening in 1863; it clocks up over three million passenger journeys a day serving 275 stations on over 250 miles of track. Bus services started in London with the horse drawn omnibus in 1829 and by 1902 the forerunner of the iconic red London bus was on the road. Visitors find bus travel a convenient way to see the city and in addition to the standard services there are hop-on and hop-off open-top tour buses for sightseeing. Tags: transport london, transportation london, london transport map, transport london tube, bus transport london, transport planner london, transport of london journey planner, london transport museum, public transport london, london airport transport, transport london fares. All photographs that appear on this web page are copyright their respective owners and London Where claims no credit for them unless otherwise noted.